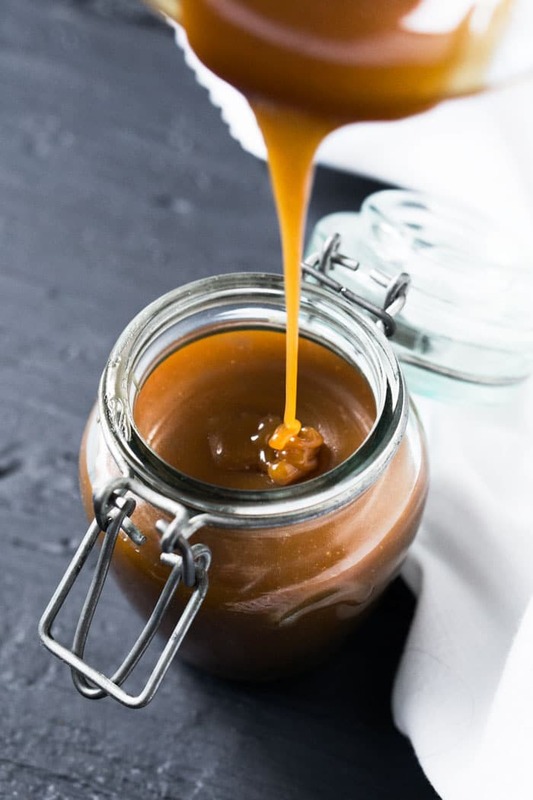 This sugar-free and keto caramel sauce is truly unbelievable! In just 15 minutes, you’ll end up with a luscious sauce that’s shockingly close to the original in both taste and texture. Oh, and no thickener required! Sugar free cooking and baking never ceases to amaze me guys! Other than being slightly less chewy, you’d be hard pressed to find a difference between this keto caramel and the traditional stuff. Which is fairly unbelievable if you think that caramel is essentially burnt sugar sauce! And guess what? It’s also infinitely easier to whip up than the traditional stuff! You don’t need to watch out for crystallization, temperature, etc. Essentially screw-up-free guys! So serve it up with some (suuuper creamy!) vanilla ice cream, and just wait to see what I have in store for you guys with this little gem! Oh, and it’s also epic as a fat bomb dipped in chocolate! 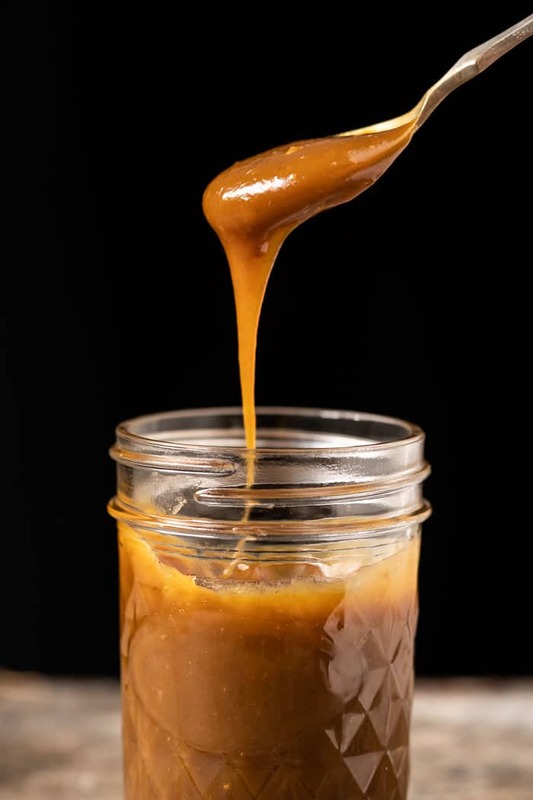 Because neither sugar alcohols nor allulose burn the same way as sugar, I took the dulce the leche route to bring you this sugar free caramel. This simply means simmering the ingredients together (and cheating a bit here and there). 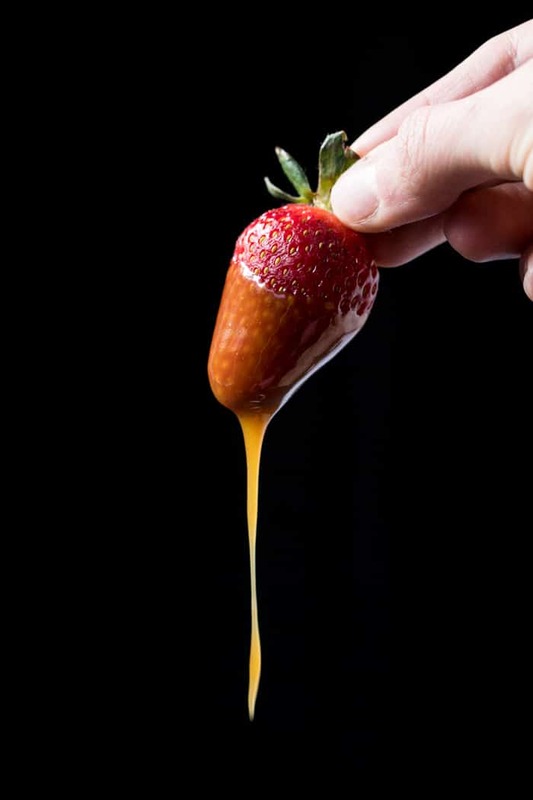 Now, while dulce de leche requires roughly a 2 hours simmer to reduce and brown the sugar, neither sugar alcohols nor allulose are reducing sugars so that wouldn’t quite do it either. Rather, I opted for a browned-butter base and adding a teaspoon of blackstrap molasses for that burnt sugar kick (and needless to say, a tonne of umami). Keep in mind that blackstrap molasses is considered a low glycemic sugar. One teaspoon (7g) adds 5g net carbs, so just 0.4g net carbs a serving (i.e. half the sugar of a strawberry!). But carbs aside, it’s also known to be a nutritional powerhouse rich in vital vitamins and minerals; such as iron, calcium, magnesium, vitamin B6, and selenium. Fun fact: Molasses contain high amounts of chromium, which has been studied to increase glucose tolerance levels. But if it’s still not your thing, read on to the section below for possible subs. 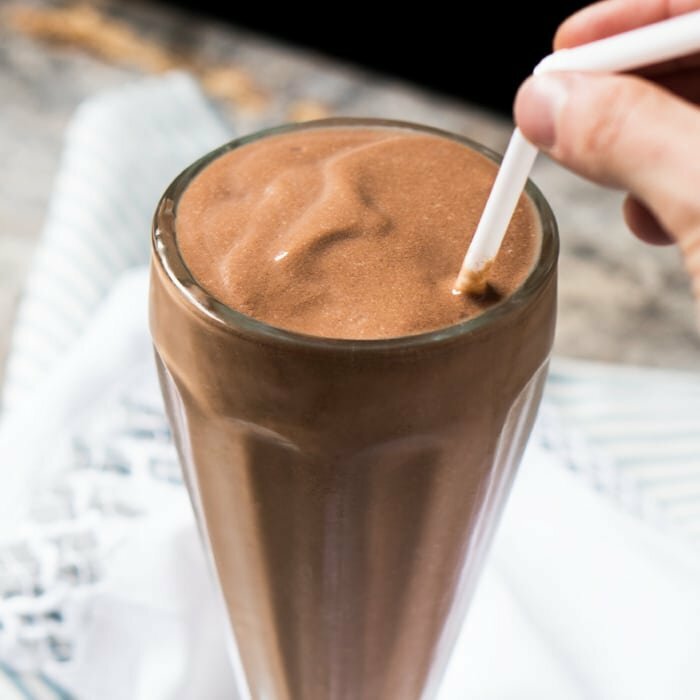 You’ve got a couple options here, and know that the recipe was thoroughly tested with xylitol, allulose and erythritol. And these are the findings! 1. Allulose and xylitol (non-corn though to avoid tummy troubles!) work equally well. The resulting keto caramel is luscious and sticky, with no thickener required. Plus, both sweeteners keep your caramel ultra smooth, and I didn’t experience any crystallization whatsoever with either. 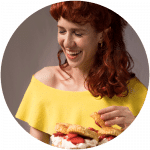 Note: I’ve been testing different brands of xylitol and have noticed Health Garden and XyloSweet are two solid ones (particularly if you tend to get occasional tummy pangs with the NOW brand). If using xylitol, make sure to be careful if you have a pup (or kitty!) around the house, as it’s highly toxic to the little guys! 2. Now, erythritol is a bit tricker guys as it tends to crystalize once cool (you can always reheat it?). I did notice that doing about 1/2 erythritol and 1/2 of allulose or xylitol seemed to keep it smooth all the way through. So if you’re not into the blackstrap molasses, try using of the brown erythritol sweeteners (say Lakanto Golden or Swerve Brown). Just keep in mind that you may need to add a touch of xanthan gum to obtain the thick ‘n sticky results (say 1/8-1/4 tsp, depending on desired thickness). How much sweetener? Now this is the question. Traditional caramel uses about 1 cup of sugar, but in my opinion 1/3 cup of sweetener for keto palates is more than enough. As allulose is 30% less sweet than sugar (and xylitol), I did 1/2 cup (but you can probably do with just 1/3 cup for a lightly sweetened caramel). With xylitol I tried with 1/4 and 1/3 cup and they both worked great (just depends how sweet you like it, and what you’re using it for). Keto sweet buds are all over the place guys, but the neat thing here is that you can adjust to taste! 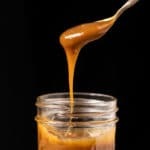 This sugar-free and keto caramel sauce is truly unbelievable! In just 15 minutes, you'll end up with a luscious sauce that's shockingly close to the original in both taste and texture. Oh, and no thickener required! 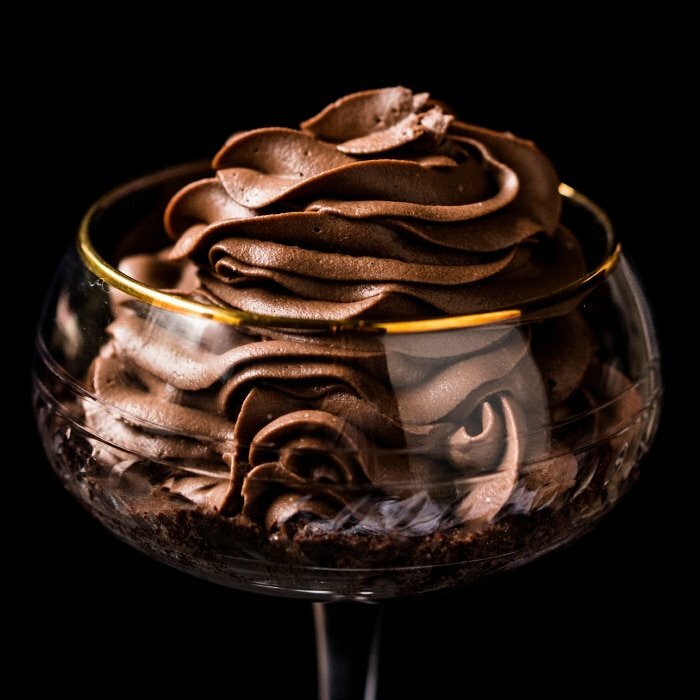 If baking with cups rather than grams is your thing, just click on US Cups for an instant conversion. Add butter to a small saucepan over medium/low heat and simmer, stirring every so often, until fully browned (about 5 minutes). Add in the sweetener, heavy cream and salt (lower amount, see notes), stirring until fully combined. Add in the molasses (optional), and stir briefly until just combined. Simmer over very low heat for 15 minutes (don't stir at all! ), taste for seasoning and pour into a glass container of choice. Your caramel should be sticky and thick, but still totally pourable. Use warm or allow to cool completely, and refrigerate for roughly a week. The caramel will thicken up in the fridge (as does regular dulce de leche), so either bring it back to room temperature or heat it up with a little more heavy cream (or say almond milk!) to thin it out a bit. *I looove salted caramel, and using salted butter adds an incredible depth that you simply don't get by just adding salt. Just be sure to taste for seasoning, as you may not need to add more salt (varies from brand to brand!). **Please see section on sweeteners for full deets! How much sweetener? Now this is the question. Traditional caramel uses about 1 cup of sugar, but in my opinion 1/3 cup of sweetener for keto palates is more than enough. As allulose is 30% less sweet than sugar (and xylitol), I did 1/2 cup (but you can probably do with just 1/3 cup for a lightly sweetened caramel). With xylitol I tried with 1/4 and 1/3 cup and they both worked great (just depends how sweet you like it, and what you're using it for). Keto sweet buds are all over the place guys, but the neat thing here is that you can adjust to taste! Please note that a batch yields roughly 3/4 cup, and nutrition facts were estimated per tablespoon. The blackstrap molasses adds 0.4g net carbs a serving (i.e. half the amount of sugar of a strawberry!). I just made this.. it tastes good but looks nothing like yours… also when i tasted it after cooling, it got grainy… n dis urz crystalize on top… mine did ! What could it be … btw i had no xylitol so used erythritol. Can tht make a difference? Hi Ash! If you read the section on sweeteners it says that if you use Erythritol that’s what will happen 😉 xo! Hi Paola, thank you for the awesome recipe! I’m wondering when should I add the xanthan gum if not using blackstrap molasses? Thanks! Hi Leide! At the end, you may need to use an immersion blender (or actual blender) to get rid or any lumps xo! I’ve been eyeing this recipe for a while. Don’t know why (hindsight) but felt a little intimidated because caramel sauce takes skill and patience, right? This was so easy and incredibly delicious! Will make this again and again! I had a hard time finding blackstrap molasses so used organic unsulphured molasses instead. Wowy, wow! So glad the recipe kept beckoning!! I don’t blame you… even I postponed trying it for a while as caramel is notoriously finicky! 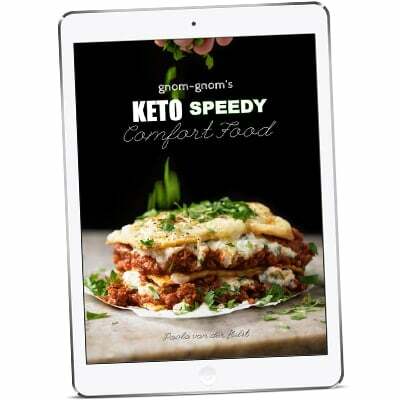 Oh surprise that the keto version is 10000 times easier lol! Glad you decided to try it Janet, it is one of my favorites from the site 😉 xo! Diane is the US Cups button below the ingredients not working? The molasses says 14 g carbs. I take it that the carb count listed at the end of the recipe is the sauce without the molasses added. One teaspoon (7g) adds 5g net carbs, so just 0.4g net carbs a serving (i.e. half the sugar of a strawberry!). 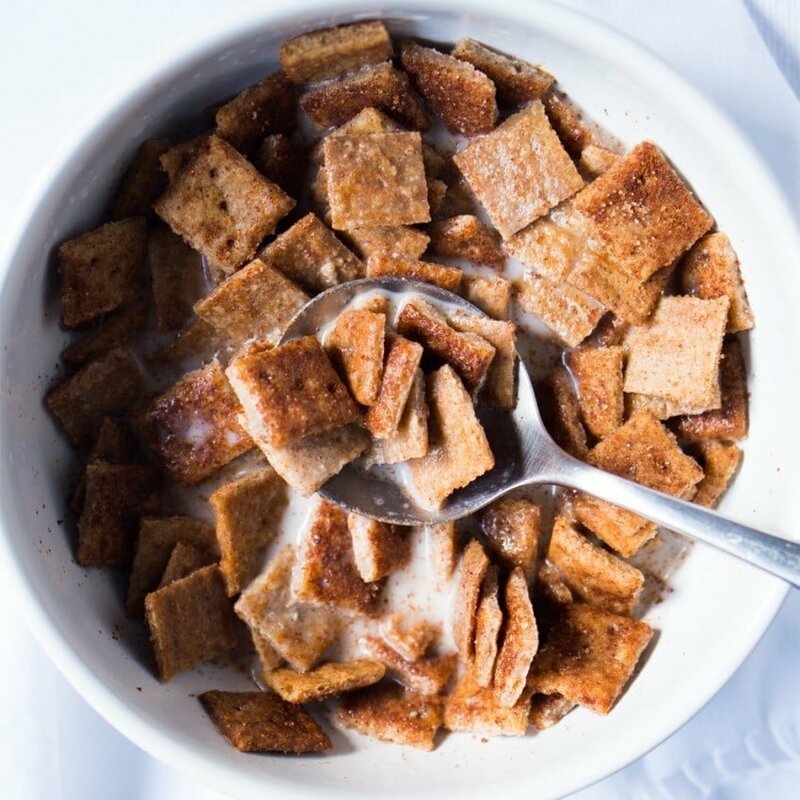 But carbs aside, it’s also known to be a nutritional powerhouse rich in vital vitamins and minerals; such as iron, calcium, magnesium, vitamin B6, and selenium. Hi Bix! Yeah its just something that happens as the cream splits when it gets too hot… in fact, it happened to me a couple months back when I moved to a new apartment and I was still ‘getting to know’ my new appliance. Sometimes you can get it back if you add a tablespoon or two of water, maybe worth reheating it and see if you can save it? Hope it helps xo! This is awesome. Using it to top some coconut ice cream I made last night. Mmmmmm. Just one question that is really more about aesthetics. It seem like the butter solids (guessing that’s what it is) stayed on top during the simmer. I did whisk it in before I poured it into my glass jar but some formed on top again. Any idea why? I used regular salted butter (not grass fed or organic). Still tastes great though!! I was so hopeful about this, following directions to a T… I used Xylitol. Mine separated upon cooling and burnt when I tried simmering again without stirring. Understandable, I hope your recovery is going well. I’ll give this another try with the heat a bit lower. Thank you! You are doing amazing things for low carbing! Makes a great topping along with toasted pecans for a keto turtle cheesecake. Thanks for this great recipe! Ohhh that’s a wonderful idea Patti! I was wondering could I bake this caramel into a low carb brownie? PS – Oh yeah and you bet I’m going to try this as a substitute in my morning latte! Amazingly easy! I used Allulose for the sweetener, ghee in place of butter and I did add the molasses. The molasses adds the perfect color and flavor. This recipe worked like a charm. I’ve made caramel using erythritol and it did get grainy. Thank you for another wonderful Keto recipe! I made this delicious carmel sauce for the thumbprint cookies for Christmas and they were just what I needed as my family munched on traditional gluten and sugar laden cookies. I’m wondering how long it will safely stay good to use in the refrigerator? Great recipe – I also add 1tsp vanilla bean paste to further enhance the flavor….